Darling is as Texan as they come, except he’s not a native Texan. He was born in Tulsa, Oklahoma, in 1942. His father transferred to a job in Houston mere weeks before his birth, but his mother was too pregnant to even travel by car (according to doctors’ rules at the time). Shortly after coming into the world, Darling and his mother came to Texas, and the state’s been central to his identit William D. Darling is a life-long storyteller. For much of his life, he’s spun narratives out of eyewitness accounts and evidence in courtroom, using that ability to win cases as a lawyer and a prosecutor. 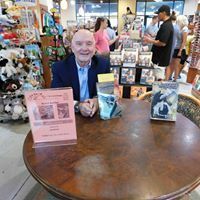 With the release of his first novel in 2015, he’s parlayed his storytelling ability into creating compelling fiction rooted in his myriad experiences. We’d love your help. Let us know what’s wrong with this preview of Anahuac by William D. Darling.
" Anahuac is out. It is the sequel. " "Thriller is definitely an apt description for Anahuac. The entire story is a fast train ride through the Texas legal system in the 1970s. What could be more thrilling than that?
" Thanks for your review. The production of the Audio book exposed the proofreading issue and they have been corrected. Your review is the type that hel Thanks for your review. The production of the Audio book exposed the proofreading issue and they have been corrected. Your review is the type that helps a writer get better. Thanks, Bill ...more "